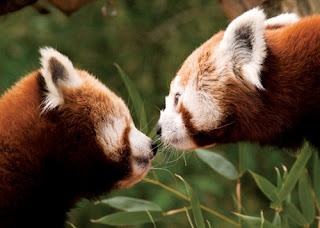 On Wings of Eagles: The Red Panda and Meeting Together. The red panda is an omnivorous mammal (though it mostly eats bamboo), between 55-60mm long, noted for their characteristic red and buff fur, long tail, and characteristic 'panda' markings on their face. Despite their name, they are not related to pandas, and belong in their own family - Ailuridae. The red panda is found in the Himalayas at high elevations, in deciduous and coniferous landscapes, where they are excellent climbers. They prefer temperate climates. The red panda has a mild disposition, likes to be alone, and is known in the wild, and in some zoos, as being a gentle and even-tempered creature. Red panda teaches us the value of gentleness. Sometimes gentleness can be a survival skill too. When we negotiate the world around us with the guidelines set forth in the Bible instead of outright fear or aggression, we often make more intelligent and wise choices. We can learn from the Red panda that even if we are happiest on our own, or wish for space to ourselves - sometimes we must take the time to spend time with others, what better place than at your church with your brother and sister's in Christ.